Fraser loves abstract in all forms but Digital, Geometric, Hard Edge, 3D and Minimalist are what fascinates Fraser the most. Colour field plays a huge part in his experimentation and creation. Focusing on sharp lines, three dimensional shapes and multi layered optical illusions, Fraser prepares his visions digitally, before transferring these creations to ‘one-off’ original pieces. 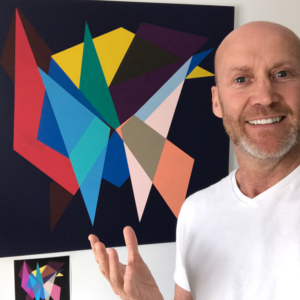 Fraser prefers acrylic paints on canvas, birch-ply or aluminium surfaces when creating linear-geometric abstracts. There needs to be an edge to this work, whether that be using gradients, texture or subtleties in the colour. For geometric works that are resin coated, this extra element protects the finished pieces from moisture, heat and physical stress. When creating sculptured tactile Geomesh Art, inspired by his late friend with whom Fraser collaborated with, Fraser hand moulds aluminium mesh that has been precision sprayed with acrylics and varnishes, creating a colour changing landscape of possibilities. The synergy when merging with geometrics, can create some stunning results! Fraser’s goals are to conceptualise, capture and design new and enticing art that delivers a capacity to create fascination, evoke deep thought through beauty as well as engage great emotion and distill mood for the viewers. Fraser was born in Edinburgh in the late 60’s. On leaving school he took a few years out, touring the US before returning to the UK to reside in London for the next 25 years. In 2015, Fraser relocated to Yapton, Arundel in West Sussex. From the early 90’s Fraser performed in a touring cabaret troupe that took him around the world, performing in the countries of all 5 continents. Apart from performing, Fraser both managed the troupe as well as creating many of the costumes, stage props, backdrops and promotional material. During this time his passion for creating became his new focal point. By the end of the 90’s, around the time of the .com boom, a change of direction towards designing and developing websites ensued. Since the turn of the century, Fraser had taught himself how to use all the tools of the trade needed to create, manage and maintain websites. Using programs such as Paintshop Pro, Paint, Illustrator and the industry standard, Photoshop, these self taught graphic design skills have progressed into creating physical art from digital creations. Fraser’s studio is located within his home in Yapton, West Sussex, where he showcases his work in the physical form at open studio days and gallery trails. Should you be interested in purchasing a piece of Fraser Renton Art, please get in touch by [clicking here].